Baseball Hacks isn't your typical baseball book--it's a book about how to watch, research, and understand baseball. It's an instruction manual for the free baseball databases. It's a cookbook for baseball research. Every part of this book is designed to teach baseball fans how to do something. In short, it's a how-to book--one that will increase your enjoyment and knowledge of the game. So much of the way baseball is played today hinges upon interpreting statistical data. Players are acquired based on their performance in statistical categories that ownership deems most important. Managers make in-game decisions based not on instincts, but on probability - how a particular batter might fare against left-handedpitching, for instance. The goal of this unique book is to show fans all the baseball-related stuff that they can do for free (or close to free). Just as open source projects have made great software freely available, collaborative projects such as Retrosheet and Baseball DataBank have made great data freely available. You can use these data sources to research your favorite players, win your fantasy league, or appreciate the game of baseball even more than you do now. Baseball Hacks shows how easy it is to get data, process it, and use it to truly understand baseball. The book lists a number of sources for current and historical baseball data, and explains how to load it into a database for analysis. It then introduces several powerful statistical tools for understanding data and forecasting results. For the uninitiated baseball fan, author Joseph Adler walks readers through the core statistical categories for hitters (batting average, on-base percentage, etc. ), pitchers (earned run average, strikeout-to-walk ratio, etc. ), and fielders (putouts, errors, etc.). He then extrapolates upon these numbers to examine more advanced data groups like career averages, team stats, season-by-season comparisons, and more. Whether you're a mathematician, scientist, or season-ticket holder to your favorite team, Baseball Hacks is sure to have something for you. "Baseball Hacks is the best book ever written for understanding and practicing baseball analytics. A must-read for baseball professionals and enthusiasts alike." "The game was born in the 19th century, but the passion for its analysis continues to grow into the 21st. 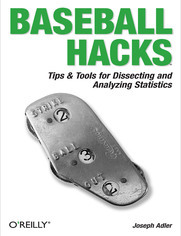 In Baseball Hacks, Joe Adler not only demonstrates thatthe latest data-mining technologies have useful application to the study of baseball statistics, he also teaches the reader how to do the analysis himself, arming the dedicated baseball fan with tools to take his understanding of the game to a higher level." Record plays during the game. Step 1: Draw columns for names, at bats, runs, hits, and anything else. Step 2: Copy the batters names. Step 3: Count statistics for each batter. Step 4: Count statistics for each pitcher. Step 5: Prove the box score. Set up a pitch outside. Follow breaking balls with a fastball. Follow fastballs with a breaking ball. Always throw the same impossible-to-hit pitch. Move the player off the plate. Step 1: Watch the umpire for location. Step 2: Watch the catcher for location. Step 3: Look at pitch speeds to determine pitch type. Step 4: Watch what the ball does at the plate. Step 5: Watch the pitcher react to the catchers signals. Step 6: Watch the catchers signals. Step 0: Buy and install a software or hardware firewall. Step 1: Download and unpack the installer. Step 2: Run the Installation wizard. Step 3: Run the Configuration wizard. Step 2: Decompress and save the file. Step 3: Open the database file. Step 4: Test the database. Getting baseball statistics as text files. Step 1: Create batters who played in 2004 query. Step 2: Create fielding by games query. Step 3: Create fielding by most frequent position query. Step 4: Create team names query. Step 5: Create batting plus query. Step 1: Download the Cygwin installer. Step 2: Run the Cygwin installer. Pattern matching through regular expressions. Preprocessing event files with BEVENT. Moving data from Access to Excel. Moving data from MySQL Query Browser to Excel. Moving data from MySQL to Excel. Creating a database import statement. Creating a play-by-play database and tables. Step 1: Find the data. Step 2: Running the queries. Step 4: Create a results table. Create the box score database. Step 1: Load the file into a data frame. Step 2: Set up the axes and the diamond. Step 1: Get the hexbin package. Step 2: Load the hexbin package. Step 3: Plot the graph. Create a batch file to plow through several teams. Dont export individual PNG images. Step 1: Define local cube contents. Step 2: Create the local cube. Step 3: Create a local web application to interact with the cube. Who Came Up with These Things? Estimate weights with linear regression. Distribution in last 10 years (19942003). Step 1: Calculate league totals. Step 2: Calculate team totals. Step 3: Calculate expected values for each player. Step 4: Calculate fielding runs for each player. Requirements for a good park factor. Park factors for run-based measurements. Park factors for other statistics. Compare individual offensive stats (singles, doubles, triples, home runs, etc.). How does a fan save value compare to the standard save value? Analysis of the hold statistic. What actually happened when teams bunted? Is bunting ever a good strategy? Extra base hits and the count. Balls in play and the count. Top players in clutch situations. Define SQL query for getting raw data. Identify possible explanations for correlations. Group players based on similarity. Attach group membership to data set. Compare predicted versus actual salaries. Vary the numbers of factors and/or number of clusters. Find or form a fantasy league. Focus on AVG, not OBP. Be patient with your money.